THE DEBUT Tour de Yorkshire cycle race will roll into action in South Marine drive, Bridlington, on Friday May 1 at 11.45am. The start and finish times of the highly-anticipated three-day cycling race have been announced by race organisers to help an anticipated one million spectators plan their day trips, cycle rides and stopovers for the upcoming event. The major international race will feature three stages including the Bridlington to Scarborough opener on May 1, stage two from Selby to York on May 2 and the final stage from Wakefield to Leeds the following day. Depending on the riders’ race speed, the cycling spectacular, organised by Welcome to Yorkshire and Tour de France owners Amaury Sport Organisation (ASO), is expected to come to an exciting finale in Roundhay Park, Leeds, on May 3 between 4.30pm and 5pm. A gruelling 174km ride from Bridlington to Scarborough – will ceremonially start on May 1 at 11.45am outside Bridlington Spa before the official race start in Sewerby at noon. The first stage will see riders tackle the Dalby Forest climb at 1.15pm, sprint through Pickering at 1.40pm, then face climbs at Rosedale and Grosmont before sprinting through Whitby at around 3.10pm and finishing in Scarborough between 4pm and 4.30pm. A 174km stage from Selby to York will ceremonially start outside Selby Abbey at 11.20am, before the official race start on the A163 just outside the town at 11.45am. The riders will take on the North Newbald climb at 12.30pm, sprint through Wetwang at 1.23pm, climb through Fimber and then sprint through York at 2.40pm on the first of two laps of the city. The race will finish in Knavesmire Road, York, between 3.30pm and 4pm. A 167km ride from Wakefield to Leeds - will ceremonially start at 12.15pm outside Wakefield Cathedral before the official start at Agbrigg Road on the A61 at 12.30pm. Riders will take on the Holmfirth climb at 1.28pm, Scapegoat hill at 1.51pm, then climb through Hebden Bridge and then Goose Eye before a sprint through Ilkley at 3.39pm. The Cow and Calf climb will follow at 3.42pm before riders take on the Chevin at 3.59pm, power through Arthington and finish in Roundhay Park between 4.30pm and 5pm. The race will be held over four laps of a 20km circuit around York with the same infrastructure being used for the Tour de Yorkshire later on May 2. The race will start at 10.30am, and with the closed roads, riders can expect significant crowds and an exhilarating racing atmosphere starting on the Knavesmire. 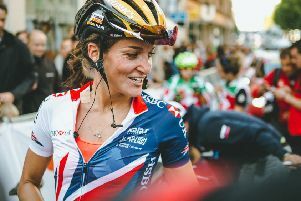 British cycling licensed riders from elite, first, second and third categories can enter the non-UCI ranked race.